Pulao is a complete satisfying and delicious dish to be enjoyed anytime of the day. Any kind of rice meal is my always go-to dish when I’m running short on time or running out of ideas on what to make for dinner. Rice is always comforting and especially if supplementary amount of vegetables are added to it, makes is fairly healthy. I had come across a package of Suhana brand Vegetable Biryani Masala, when all of sudden the idea of making a mixed vegetable pulao with a hint of vegetable biryani masala and shallow fried marinated paneer cubes came to mind. We were actually planning to visit my family since it was my niece’s 10th birthday and what a better way to celebrate than to enjoy a variety of different dishes. 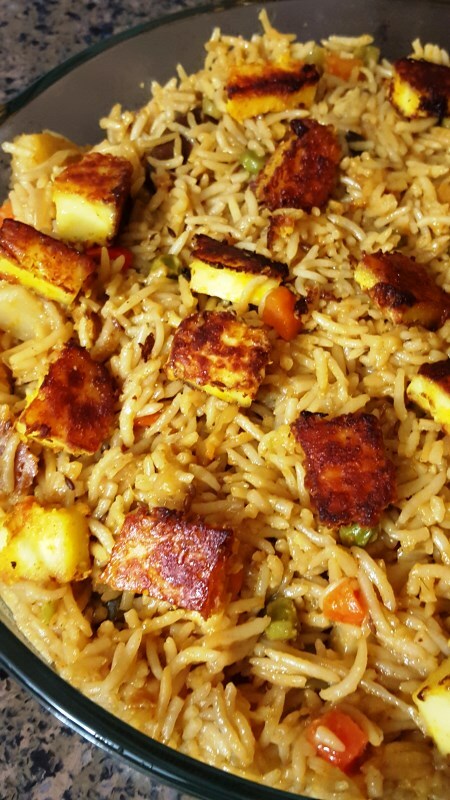 With all that said and done ….I hopped right into it and created my exceptionally delicious, but completely scrumptious mouth-watering Paneer Pulao with a twist of Veggie Biryani Masala. The special Suhana Veggie Biryani Masala Mix that I used in this pulao is exotic mix of aromatic spices dried garlic, onion, ginger, mint, red chili powder, bay leaf (taj patta), clove, black pepper, cumin, green cardamom and turmeric. The combination of spices used in this package can be overwhelming , but the blend of spices used is quite unique but it is advised that use spice mix proportionally as the taste can get intense. 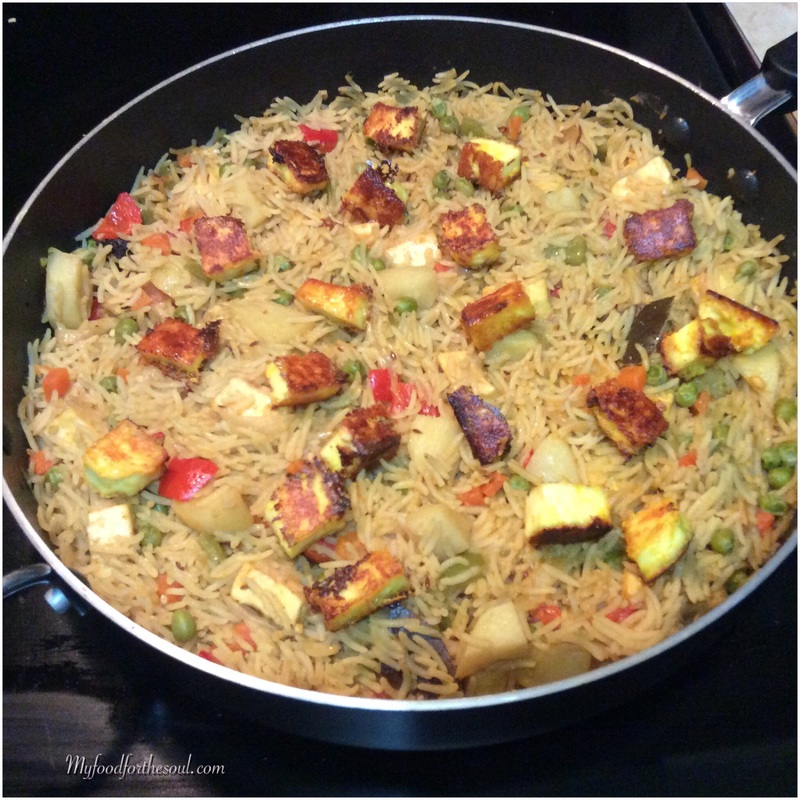 One of the star ingredients used in making Paneer Pulao is it self Paneer. I used store-bought paneer in this recipe, but if your one to make it fresh then that works the best. Small cubed paneer marinated in a home-made yogurt mixture and then shallow fried till nice and golden brown makes the perfect topper on this rice dish. I also used a specialty Pakistani long grain rice which is used in making biryanis, these rice grains cook well and each grain separates leaving a nice and loose effect on the pulao. If you like using basmati rice, the that works great also. This Paneer Pulao is a party pleaser, be sure to try it out at your next dinner party, potluck or just a nice family dinner. Pair up this Paneer Pulao with a nice simple chaas (buttermilk) or a simple cucumber raita for your next meal. This recipe serves up to 6-8 people for a typical dinner. Into a bowl add 200 grams of diced paneer then add 1 tbsp. Oil, 1 tsp. red chili powder, turmeric, yogurt, 1/2 tsp. salt, gram flour. Mix well and keep aside for 30 minutes. Heat 1 tbsp. oil in shallow fry pan. Remove the marinated paneer pieces with a slotted spoon. Drain off any excess marinade and slowly add to heated oil to shallow fry on medium flame until golden brown on all sides. Do not fry for too long, or they will burn and turn into a rubbery texture. In a large heavy bottomed pan, heat the ghee + 1 tbsp. Oil. Once hot add in jeera and let it splutter for 30 seconds, then add in garlic/ginger paste and sauté for another 30 seconds until raw aroma is gone. Add in sliced onions and sauté for another 1 minute till nice and pink. Add in Vegetable Biryani Masala, red chili powder, and salt to taste and 1 tbsp. of water give it all a good mix and cook for 1 minute again. Now add in 4 cups of water. Cover and bring to a simmer. Add the rice, stir well, do a taste test and adjust salt and spices; once done cover and cook on a low flame for 10-12 minutes, until water is absorbed and rice is cooked. Remove the cooked pulao in a large platter/plate. Arrange golden paneer pieces over the top. Garnish with fresh coriander. 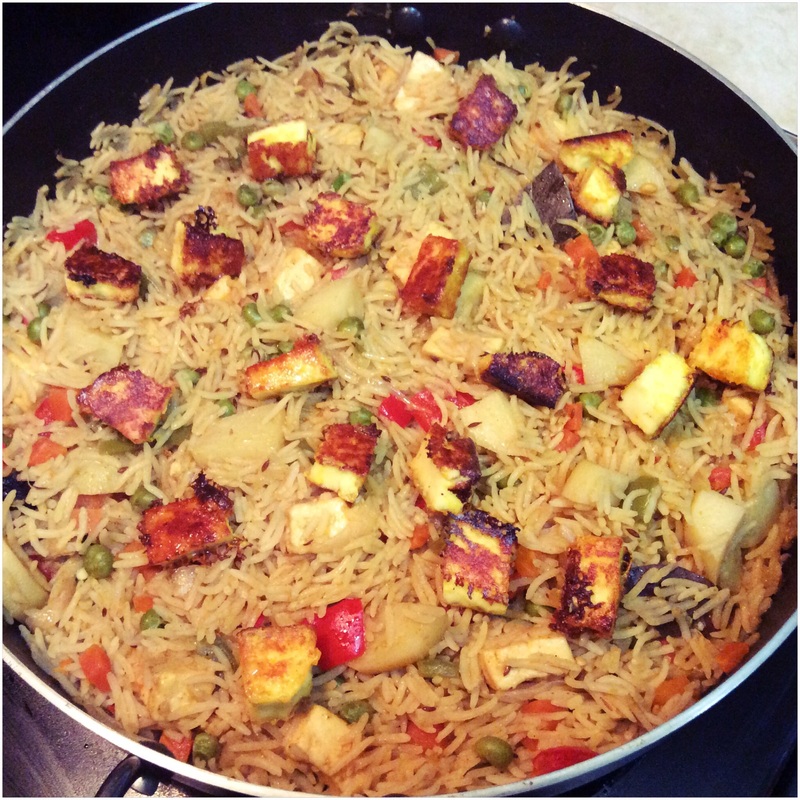 Recipe has been somewhat adapted from Saffron Trail-Paneer Pulao; but changed up to suit my tastebuds.